Oatmeal Cookies with Golden Raisins and Cranberries - chockful of goodness! Oatmeal cookie lovers - this one is for you. 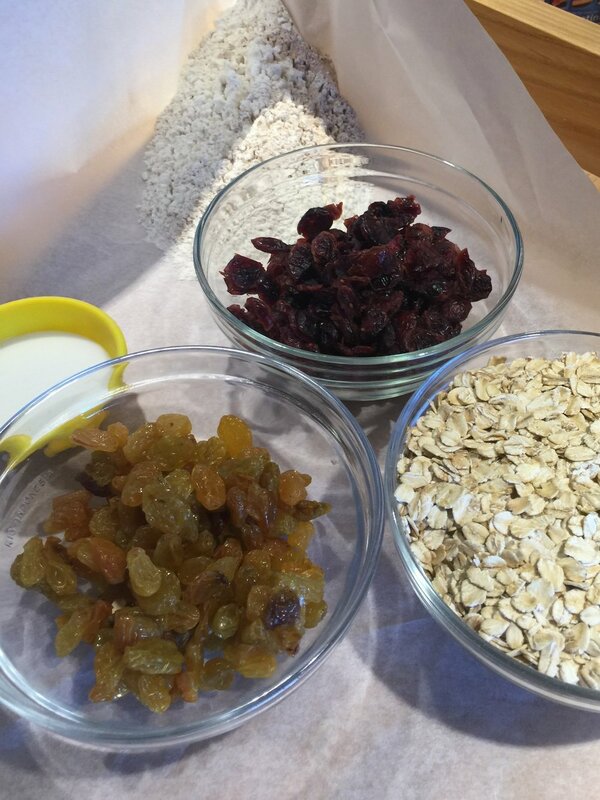 Where do the best Oatmeal cookie recipes come from? Usually from simple sources. When queried many pros will say "Joy of Cooking", "my grandmother, the back of the Quaker Oatmeal box and Fannie Farmer's baking book. No Larousse, no Lenotre, no Le Cordon Bleu - this is an American cookie. Perfect to tuck into a lunch box or to enjoy with a tall glass of milk. As a kid, I made the recipe off of the Ouaker Oats container - but it spread a little and I as advanced in skill and knowledge it bothered me. But for the most part in the years when I was cooking and baking all over - my customers were perfectly happy with that cookie. Oatmeal cookie lovers are rarely super picky - they are happy with sweet crunch of butter, sugar and oatmeal - perfection is rarely a thing. Teaching at Le Cordon Bleu years, I didn't make them - they weren't in the program - French cookies were. And honestly bakers, I baked and cooked so much at work in those years that I didn't bake them. I missed them. They did appear in the Art Institute intro to baking class - the recipe provided was great, so I went to work on a new one with the help of Chef Wong. I added the cranberries when I started to bake for the pastry case. Here is that recipe - scaled down from the one that I bake for the case. I think you will like it bakers. Another cookie for your repertoire. Can we ever have enough? Let me know if you have questions and please let me know how your baking is going. Stand or handheld mixer, spatula, scoop, one or one-half ounce, 1-2 sheet pans lined with parchment paper, scale and teaspoons. Yield: 13 cookies with a 1 ounce portion scoop (Baker’s Dozen or 26 cookies with a ½ ounce scoop. Note: this recipe can be doubled or tripled. 1. Sift the flour, baking powder, baking soda, cinnamon, nutmeg and salt together. Set aside. 2. In the bowl of a stand mixer, fitted with the paddle attachment combinebutter, the sugars and the vanilla. 3. Mix on low speed until the ingredients are roughly combined and then increase speed to medium and mix for 2 minutes. Scrape down. Butter, sugar and vanilla are creamed until the butter is fully incorporated but it is not light and fluffy - sugar feels gritty - that's correct for cookies. 4. Add the egg, mix on low speed for 20 seconds, scrape down, mix on medium speed for 25 seconds. Scrape down. 5. Add dry ingredients. Mix on low speed 30 seconds. 6. Add oatmeal. Mix for low for 30 seconds. Add raisins, cranberries and optional nuts. Mix on low speed until all the ingredients are incorporated but do not over mix. This can even be done by hand with a sturdy spatula. 7. 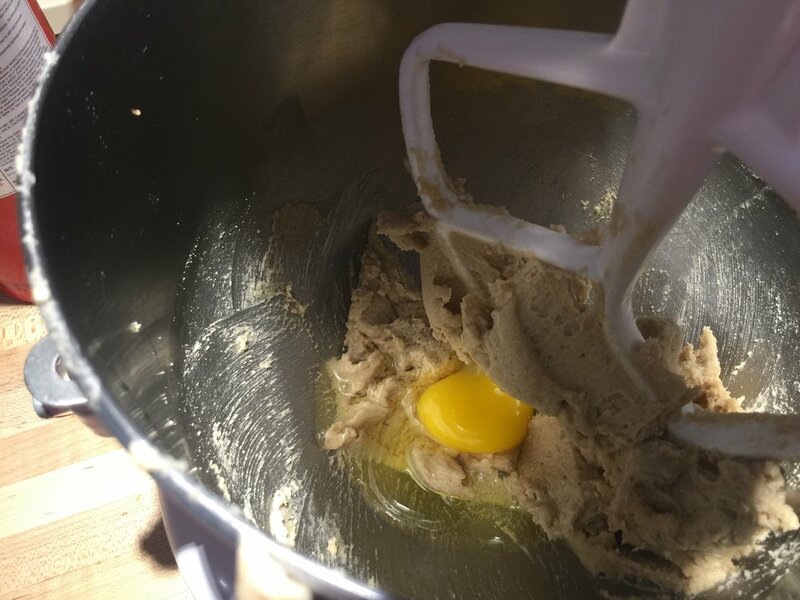 Drop the dough with a cookie scoop onto lightly greased or parchment-lined baking sheets, leaving about 1 1/2 inches between each ball of dough. Scooped cookies ready to bake. Bake the cookies in a preheated 350°F oven for 12 to 15 minutes, or until they're golden brown. If the bottoms of the cookies are becoming too dark then double pan and finish baking. Remove them from the oven, and place the pan on a wire rack. Store them in an airtight container. Also the dough and the baked cookies both freeze well.